Prohibition ended 80 years ago and in that time, craft breweries have reemerged and only recently been picking up some steam and growing in number to over 2,000 in 2012. This includes about 30 breweries in New York state. But while other boroughs — Brooklyn, Manhattan and the Bronx — got their own breweries, Staten Island and Queens lagged behind. For Queens, this changed as a series of late-2012 brewery openings got Queens out of the no-brew rut: Rockaway Brewing Company in Long Island City introduced their brick-and-mortar location in the summer, Bridge and Tunnel Brewery in Maspeth got off the ground in September and SingleCut opened to a lot of fanfare in early December. 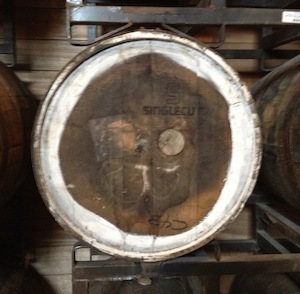 While Rockaway and Bridge and Tunnel were a bit under the radar, SingleCut gained a lot of buzz — and they deserved it. Not only were they set to churn out good beer, they had a fantastic team led by President and Head Brewer Rich Buceta. If you take a look at the site, you’ll notice that the brewery as a whole has a bit of a rock-and-roll theme. The tap handles are guitar necks, some of the beers share names with musicians and the name of the brewery is even a reference to a type of guitar. It ties everything together very nicely. And as an Astorian, I couldn’t help but be excited about a decent brewery opening just a few blocks from my home. A few weeks before the team cut the red ribbon in their tasting room (literally — Queens Councilman Peter Vallone did the honors), SingleCut reached out to me and invited me to try some early samples. Not one to turn down such an illustrious offer, I met the man behind the @SingleCutBeer Twitter handle (incidentally the same man behind @AstoriaHaiku which I highly recommend) and took home three brews. At 8.6% ABV and 119 IBUs, this double IPA (no that’s not a typo in the name) has a bite. It starts with a strong grapefruit aroma but it’s balanced out with a malty backbone mixed with passion fruit flavors. This is a seasonal brew that’s not yet available but when you see that sucker, make sure you try it! The more sessionable (5% ABV) version of the double IPA, this tastes very similar but has less of that bite with only 66 IBUs. Without the bitterness of the full-on IPA, the sweetness of the passion fruit and malt are a bit more noticeable. I’d certainly never call this a “sweet” beer but it’s less bitter. This beer has a kind of “little lager that could” story. Apparently Rich was not terribly excited about this brew but after fans defended it over Facebook and Twitter, the team decided to make this a more permanent member of their collection of beers. Flavor-wise, this leans more toward a stout than a lager. It features coffee, molasses and chocolate. I really enjoyed it and I’d love to try it again. Having tried these three beers, I was pumped for the grand opening which took place December 8, 2012. We joined the rest of Astoria to celebrate our new home-grown brewery and tried two more of their beers. Their flagship lager, this is the only beer that does not bear the name of a musician. Instead, they named the beer for their address in Astoria — 19-33 37th Street. It was a great beer to start out with that day. At 45 IBUs, it’s not too bitter but it’s hoppy enough. A nice amber red ale is where the hops and malt meet. This is one of my favorites of the bunch and each time I’ve returned since the opening, I’ve ordered a sample of this brew. Of course, I already know what it tastes like! But any chance I get to drink it, I accept. These days, SingleCut’s tasting room is opened limited hours during the week (Thursday and Friday evenings and Saturday during the day). The tasting room is gorgeous and roomy and has a nice view of the brewery. You can also politely ask for a tour. In fact, if you want to rent the place out for an event, that’s an option too! 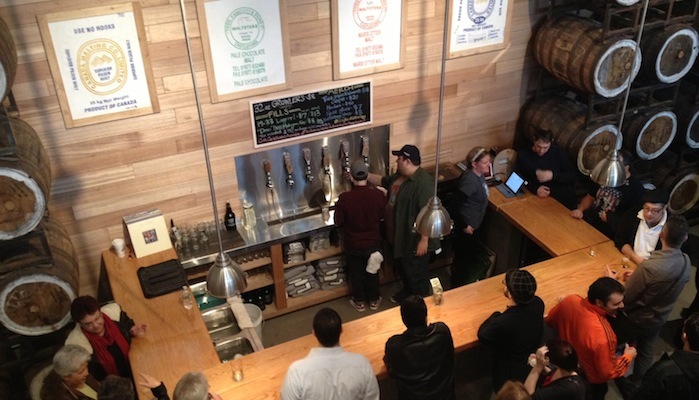 They’re beers are also on tap around the five boroughs — as far as they can reach. Since they’re self-distributing, they’re limited to the distance they can reach and the amount they can distribute. But it wouldn’t hurt you to visit Queens Kickshaw, Sunswick or any of the places where SingleCut is available to get a taste of this up-and-coming brewery.